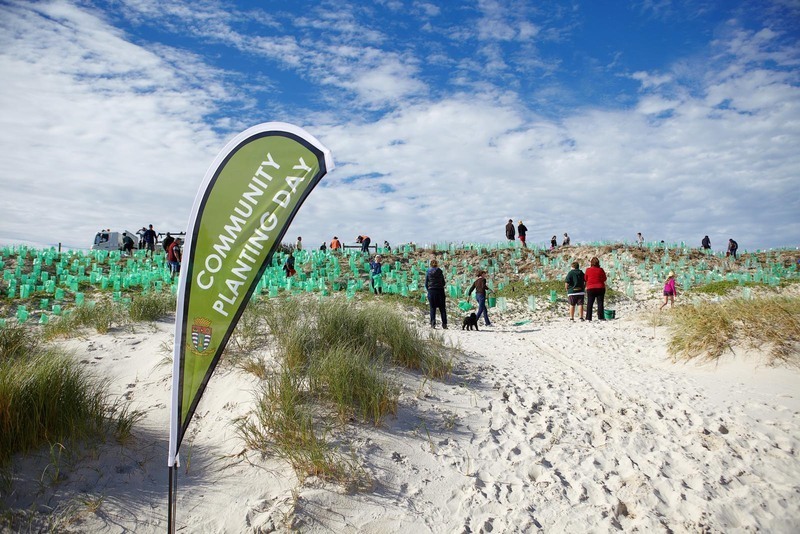 Our 2012 plantings at Mosman Beach need our attention on Sunday 27th January anytime from 8.30am to 11am. All help accepted! No experience required! Come and join Friends of Mosman Park Bushland volunteers for a morning in the dunes, best views guaranteed. Learn what are weeds so you can be a wildlife warrior anytime! Sturdy shoes, hat, sunscreen and a waterbottle are all you need! Morning tea, gloves and tools are provided! How to get there: Closest train station is Victoria Street Station. Get off on the ocean side and walk along Marine Parade towards Fremantle, approximately 1 km. Last beach pagola with red tin roof.! Look for our banner! Bike path located right beside Mosman Beach. Don't forget your bathers for a cool down afterwards! 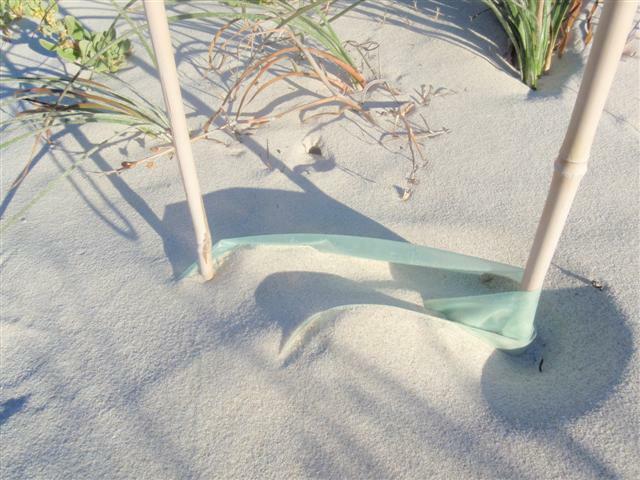 Harsh conditions in the sand dunes. Looks pretty now but this weed Cakile is not favoured by our wildlife. ommon on our dune you may have thought it belonged. 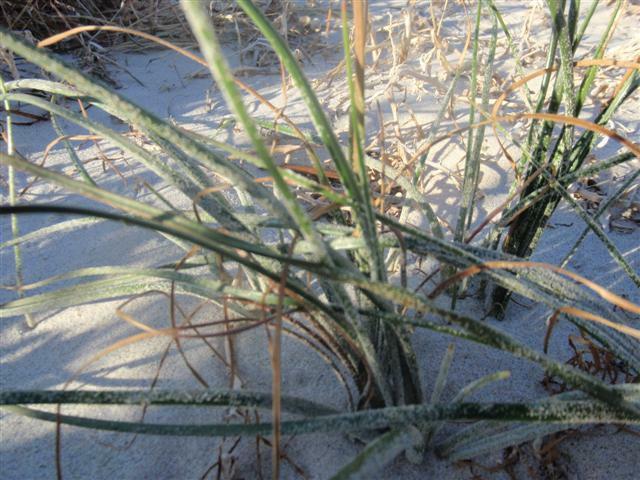 Get close up to this weed Trachyandra so you can recognise it always. A local wattle pushes through the weedy tetragonia. The seed balls belong to coastal spinifex and can be half buried on the leeward side of the dune for propagation. Sunday proved to be a very successful day for the Mosman Beach restoration project. Sixty volunteers participated on the day which resulted in the very commendable planting of 1300 coastal tree and shrub species. It was a remarkable effort by all with all the new plants (and even some of the older ones) watered, and there was still time and willing participants who completed maintenance activities on the tree guards!! Many locals commented that they will come by and check on their plants as they walk along the beach, which is a great way for the community to take ownership and care for their local area. Mosman Beach’s care has been given to the Town of Mosman Park Council. Thank fully it is only 400metres in length but adds to the large area of park and natural areas vested to the ToMP. The Department of Environment and Conservation realise the burden to local councils of maintaining public bushland and will give grants to help after submitting lengthy applications as long as the council will match the funding. This is where volunteers come in as each volunteer hour is worth $30 in kind to the application. We donate that freely and generously to be able to make a difference. Although the care of this strip of beach is vested to the Town of Mosman Park it is public land that is well used by many Perth residents as as the Town have allowed dogs use of the beach. Many know how important this green restoration is as shown by their eagerness on Sunday. Bravo to the large Scotch college contingent who were powering away and made it possible to plant 1300 plants. It is almost incomprehensible how this beach was used as a rubbish dump for all manner of waste which has been an ongoing expense to rectify. 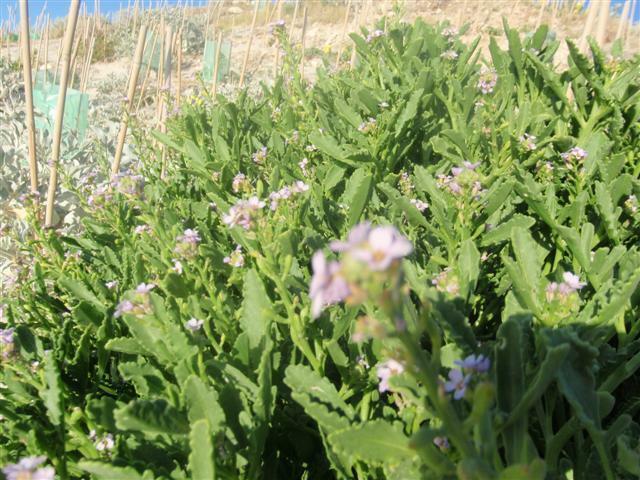 The beach was stabilised with introduced plants which offered no benefit to our bird, reptiles and other wildlife and have become weeds. With dwindling bird and reptile species left on our coastline, now is the time to take our action. Cottesloe Coastcare volunteers are making sensational progress with their very long piece of coastline. By joining up with their restorative work, we are increasing wildlife habitat. 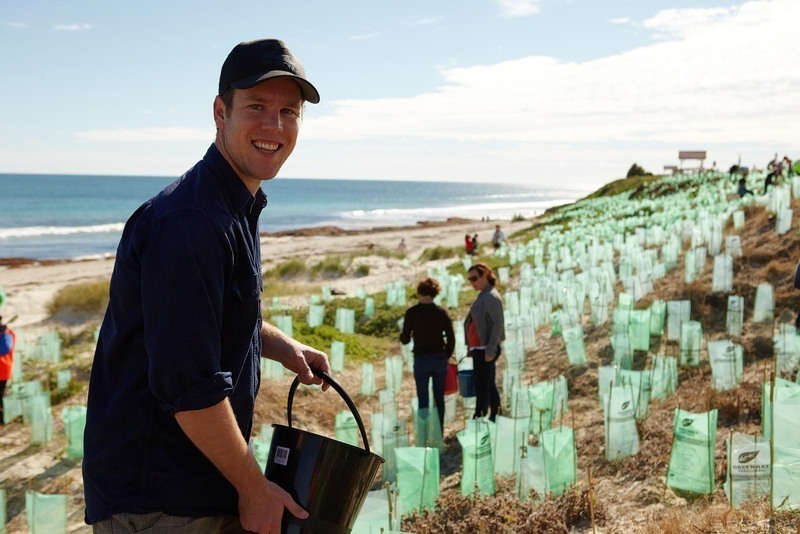 With larger natural areas north of Cottesloe, a mark of volunteers success was to site a variegated blue wren in a yard in Cottesloe in 2010. Could we bring them back to Mosman Park? Yes, they used to be in Mosman Park! Mosman Beach foredune has a nice runner of spinefex remaining but apart from a couple of hardy windswept silver olearia plants all local plants had gone. On Sunday we planted a diversity of local species which is the key to a healthy ecosystem. Plants support each other not only with wind protection, enriching the soil but bringing wildlife such as insects, birds and reptiles which can find habitat here all year round and increasing the chance of viable seeds and dispersion to continue the next generation. The plants we put in on Sunday included two sedges, Ficinia nodosa (nodding rush) and Lepidosperma gladiatum (Sword sedge). The sword sedge was the first APACE nusery had grown from seed. Previously the only known commercial way to propagate it was from subdivision. Many local seeds will germinate from smoke treatment but not sword sedge.It has been discovered that sword sedge seed will germinate after some time in the freezer. Not sure how that was discovered but I was asking a very experience bushland worker if they had any success germinating the seed as I was keen to reintroduce into areas of Mosman Park where it belonged especially as it is a good fire retardant. She hadn’t tried but said she pulled all her sword sedge out of her garden and after the March 2009 hail storm lots came up. The seed for our Mosman Beach plantings came from Minim Cove Park along with the Melaleuca hueglii (Chenile honeymyrtle), Hardenbergia comptoniana (native wisteria), Clematis linearifolia (old man’s beard), Acacia lasiocarpa (Prickly Moses wattle) and Spyridium globulosum. Seed was collected from Buckland Hill for the Templetonia retusa (cockies tongue) seedlings just before a fire went through. So great to have these beautiful shrubs in another area to protect their survival. They have also been reintroduced into Minim Cove Park after the fire in January 2008 wiped out all but one plant. The rabbits keep the new plantings bonsaied. It will be many years before seeds are produced. 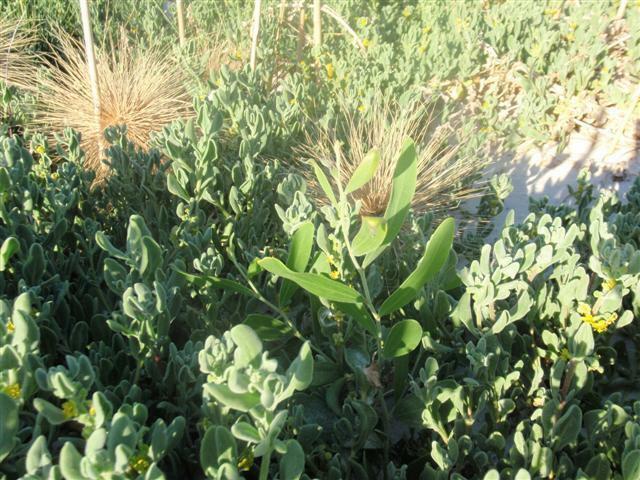 Acacia rostellifera (wattle), the white Leucophyta brownii (cushion bush), two species of atriplex (salt bush) and Carpobrotus virescens (pigface succulent) were also planted. When you start growing these plants you wont be able to offer up their prunnings for the quarterly green waste pickup as you maybe throwing out the black geckoes that have golden eyes with them. Then you’ll break up the prunings and put them under the shrub and realise you are saving water by mulching, returning the nutrients from where they came, providing safe habitat for a number of small lizards who want to live in your garden and keep pests under control, you’ve keep the earth cool and moist to keep the fun guys alive who’ll help the roots of the shrub take up nutrients. Plus you haven’t wasted energy or caused pollution from trucks hauling the greenwaste away. Wow! We can really make a difference! Back to our beach plantings! This is the start! Those little guys are going to have a tough time where we put them. Can I get you all to own them and love them. The plastic sleeves will protect them or they will kill them. Before long the stakes will be loose from the morning easterly wanting them to take on a westerly lean then the afternoon breeze wanting them to take on an easterly lean. The sleeves will be so loose the northerly storm will either blow them right away or smack them onto our plantings to be baked by the sun. This will be a good reason to get you on your bike, out for a walk or even take your dog to the beach and see how the plants are doing. If you cant tighten up the sleeve enough so it is not touching the leaves then make a windbreak out of the sleeve using the middle cane as a peg to stop the sleeve flapping the plant. If plants have died then stack up the sleeves and secure a rock, brick (ToMP’s reminder of it’s previous use). Maybe by October some of the plants will be out growing the sleeves so the sleeve can now be used as a wind break. You will see how you can position the sleeve as a windbreak and as a water catcher. It will be best to leave the sleeve as a wind break until the end of summer unless you can see otherwise. Black Flag (Ferraria Crispa) corms are loosely attached to the plant and need to be dug out rather than pulled out. Often smaller corms penny stack under the main corm. This herbicide resistent bulbous weed runs rampant in our bushland when garden waste is thrown into Perth's bushland. Join us on Sunday June the 24th any time between 9 and 1 at Mosman Beach south. Mosman Beach is between Leighton Beach and the southern end of Curtin Avenue - just look for the signs! This legless lizard has a pointy nose and a stripe on its back. Jane with an armfull of wild oats smothering our groundcover plants. All able bodies required this Sunday at Minim Cove Park as we race against time to spread mulch around our new plantings. This will lock in soil moisture, reduce evaporation, suppress weeds, enrich the soil with nutrients, microbes and water holding properties! Irresistible! The weather also is forecast to be irresistible for being out doors helping and enjoying the bushland. A mountain of mulch will be delivered for us by the end of the week! Other tasks available on Sunday are weeding just inside the fence and checking plastic sleeves around our plantings. The weeds have enjoyed our rain pattern this year with a burst of growth. As our plantings grow they will suppress weed growth but seeds now will be in the soil for at least seven years. We have a bigger area to manage with virtually the same number of volunteers. You can see how they have got a way from us! In areas of high priority biodiversity we are weeding more carefully with the intent of eventually decreasing the weed load. This week traps have been set at Chidley Point Reserve, Bayview Park, Minim Cove Park and Buckland Hill bushland. Our bush care officer at Town of Mosman Park, Heidi and other enthusiasts as far away as Swanview have been out at 5am each morning. About 10 species of reptiles have been caught in good numbers. Names have been put to species seen in Minim Cove Park. Facts about what these reptiles eat and their behaviour have been learnt. One blind snake and one legless lizard have been caught which is good news for our bushland health. One observation made on this fauna survey was that everyone who attended had smiles despite the early hour. The survey is continuing each morning this week with Sunday 27th November the last day. So if you would like to see and hold our reptiles, head to Chidley Point Reserve, upper car park by 5am. You will never get this opportunity again to see close up the critters that race around the bushland too fast to observe or too hidden to see. See you from 9am to 11am! Equipment supplied! Bring a hat, sturdy shoes and a water bottle! Morning tea supplied!